The first edition of the Prudential RideLondon-Surrey Classic road race takes place on Sunday, August 4. A total of 150 riders from 25 teams will embark from the Queen Elizabeth Olympic Park at 12.45pm, and then traverse a 140-mile route south to Surrey and back into the capital. The route takes in the climbs of Newlands Corner and Box Hill, and features three leg-sapping circuits of Leith Hill in between. Then it’s back to The Mall for a finish in front of Buckingham Palace. The UCI 1.1-ranked race features a mixture of WorldTour, Professional Continental and Continental squads along with a Great Britain Academy development team. Double Tour de France green jersey winner Peter Sagan is arguably the biggest star on the start list, heading up Cannondale’s line-up and must rank as one of the favourites for the victory along with 2013 Milan-San Remo winner Gerald Giolek (MTN Qhubeka). The hilly route leans towards favouring Classics riders. 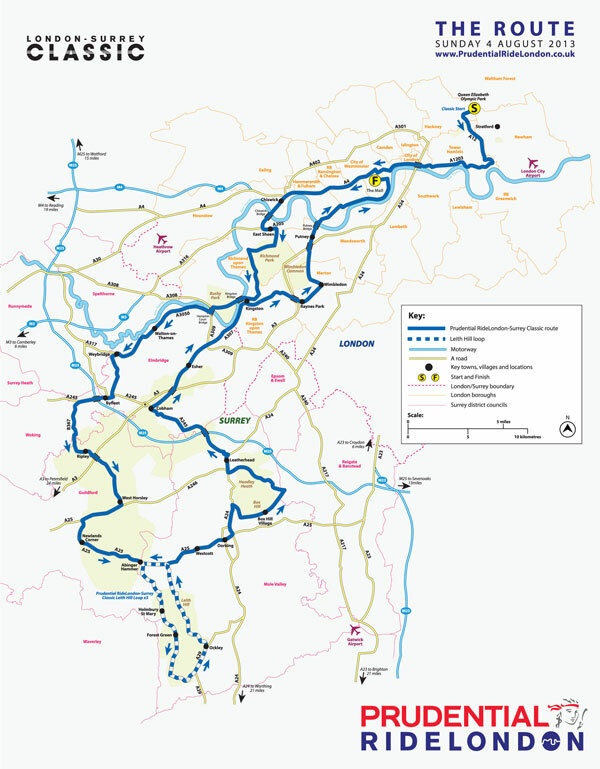 Although the hills are all in the middle of the race, both the men’s and women’s 2012 Olympic road races proved that a breakaway can stay away from the efforts of a chasing peloton on the way back into London. That’s something that could play into the hands of riders such as David Millar (Garmin-Sharp). International riders will also face stiff competition from the cream of home-grown riders, with Madison-Genesis, Raleigh, Rapha Condor, Node4-Giordana, UK Youth, Rapha Condor and IG Sigma Sport all fielding their best talent. With plenty of opportunity to watch the race at the roadside and live on BBC and British Eurosport, the inaugural Prudential RideLondon-Surrey Classic should provide a great spectacle for British race fans. All-round talent Sagan simply cannot be ruled out of any race, and the profile of the RideLondon Classic will suit him perfectly. Enough hills to whittle away some of the pure fastmen in the central section of the race, Sagan is perfectly at home winning from a break or from the bunch. The real question is: what will his victory celebration be? Ciolek is enjoying his best season yet for African team MTN Qhubeka. A surprise win at Milan-San Remo has elevated his status among the greats and he should figure in the top order of the results sheet. The wins haven’t exactly been flowing for Aussie Matt Goss since he joined the start-up Orica-GreenEdge in 2012, but he’s still a sprint force to be reckoned with on his day. The 2008 Tour of Britain sprint classification winner also seems to feel at home on British roads. With no Mark Cavendish (Omega Pharma) in the race, British sprint hopes fall firmly on Ben Swift’s shoulders. Swift is still building form after early season injury and illness, and comes into the RideLondon event straight from the Tour of Poland, which finishes on Saturday. A first win of the season in London would really be something. Fresh from the Tour de France, Millar is undoubtedly Britain’s biggest star at the race. The Scot could be a key figure in a breakaway, but if it comes down to a bunch finish could play a team role for one of the other Garmin riders, perhaps 2013 Giro d’Italia and Tour de Romandie stage winner Ramunas Navardauskas. Modolo had a good early start to the year, beating Mark Cavendish in a straight sprint in the Tour de San Luis. A win is probably out of the question in this company, but a top five is likely if it comes down to a bunch gallop. Vacansoleil-DCM field a strong squad for the race, and any one of their five riders could excel if put in a break. We’re picking Boeckmans as the team’s likely sprint contender on The Mall. Kristian House (Rapha Condor), Mike Cuming (Rapha Condor), Ian Wilkinson (UK Youth), Evan Oliphant (Raleigh), Erick Rowsell (NetApp-Endura), Joseph Perrett (IG Sigma Sport), Steve Lampier (Node4-Giordana), Dean Downing (Madison Genesis), Simon Yates (GB). Approximate timings for when the race will pass through certain locations. Timings based on an average speed of 27mph. Intermediate sprint points and King of the Mountains points noted. The RideLondon-Surrey Classic will be shown live on BBC One and British Eurosport.